we have a ceiling fan and it was only used once. I freaked on Peter, my husband, about the bird''s safety and it's never been used since. 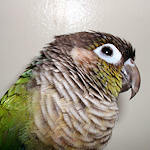 We have 3 parrots, the parrotlet is flighted, and the conure and senegal are clipped. It's over 100F here, and where the bird sleeps it's even hotter so I turn it on when she's in the cage and asleep. Even though she's clipped, I wouldn't risk the fans being on when she's awake. I'm actually more scared of the crazy cats that like to hang around our yard and eat birds. Once I turned my head for seriously, a split second, and the cat came out of nowhere and was ready to pounce on the cage. We have ceiling fans in every room, and use them. I live in Australia, there's no other choice. However they're only on when the birds are in their cage. Is their any other risk? We have ceiling fans in every room and from about April to November they are on. When I had my parakeets I would turn the fan off in the room while they were out for playtime. When I put the girls in the playroom to fly I turn the fan off there, but otherwise they stay on. The girls can fly high enough to be of concern, but they avoid them like the plague. They see this big dark thing in the air and probably 'think' predator, still I turn the one in the flight room off when they are in there. The other 3 can't gain enough altitude to bother. I have 5 ceiling fans in my house and use them all in the warm months. The birds are never loose when they are on and even when its feeding time and I open the cage door I make sure I have turned them all off. I am always afraid even for a second they will fly out of the door and fly into the fan. Same goes for making sure all doors are shut and everyone knows when the birds will be out not to open a door, or cook on the stove etc. (I belive someone already mentioned this, but I do the same). I do not have one directly over the birds so I don't worry about drafts. Oh I forgot who wrote about being scared of being decapitated by a fan and I can relate, I always say, what if the screws loosen and it goes flying off the ceiling or the light fixtures fall off and hit me while I am sleeping. So your not alone lol! kellybird wrote: Oh I forgot who wrote about being scared of being decapitated by a fan and I can relate, I always say, what if the screws loosen and it goes flying off the ceiling or the light fixtures fall off and hit me while I am sleeping. So your not alone lol! Tell me about it, in Brazil throwing the nephews around I was always scared of that! You should see the ceiling fans we have at my family's home in Jamaica.. They are the most intimidating things ever. They shake while they're spinning and make funny noises... Which does litlte to instill confidence. My home has like 3 ceiling fans, my bedroom, my parents' bedroom and one in the back kitchen downstairs. We only use the upstairs ones when its really humid. I just keep a door shut to our storage room(which is in the path to my parents' room). That way my Senegal won't get too curious in neither room ontop of avoiding the ceiling fan issue. I only use mine when its necessary but even I find it useless(just pushes around hot air mostly) so it doesn't get turned on very much. I never have it on when the bird is hanging out with me upstairs though. He had been clipped but can fly again. The ceiling fan downstairs rarely gets turned on, maybe once a year so I don't worry about that one much. I still make sure no one has it on before I take Cody out of his cage though. I am more concerned about doors and windows in this place opening and closing often. People come and go a lot here so I have to wait a lot for a good time to allow the bird out of his cage and where he can be. Otherwise he just spends his time in my room mostly. I'm more comfortable with my ability to keep a parrot from flying out a window than I am with my ability to always make sure the fan is off, so I don't use a ceiling fan. A lot of floor fans make me nervous too. I put clear packing tape along the top, to make sure that if they get landed on, feet won't fall through. On the other hand, the birds never land on the fans, maybe they aren't that dumb. Mostly I worry that a spooked bird will land badly. I like the venturi type fan... the kind that has a cowl around the circumference. There is a lot more covering to prevent a foot slipping through. They can be angled to blow straight UP, so I don't need a ceiling fan. They can blow so hard, I don't think a small parrot would be ABLE to land. SlaveToAParrot wrote: I only use mine when its necessary but even I find it useless(just pushes around hot air mostly) so it doesn't get turned on very much. You might find that your ceiling fan is on the wrong setting. Most fans(that aren't too old), have a switch that changes them from a winter to summer setting. One way pushes the air down, the other draws it up.